The Ciskei is not the only Bantustan with differing flags. The detail for the leopard's head in the flag of Bophuthatswana, for example, differs whilst the font for the capital letter in Venda's flag also shows some variation. Some of the flags also depict colour variations, but none seemingly portray the amount of discrepancies present in the Ciskei flag. So what is the reason for the widely differing portrayals? According to Bruce Berry, Website Administrator of www.flagspot.net, the simple answer lies with the manufacturer's license. The manufacturer followed the specifications on the official artcard as opposed to that described in the Act. This could possibly explain the presence of the variants. 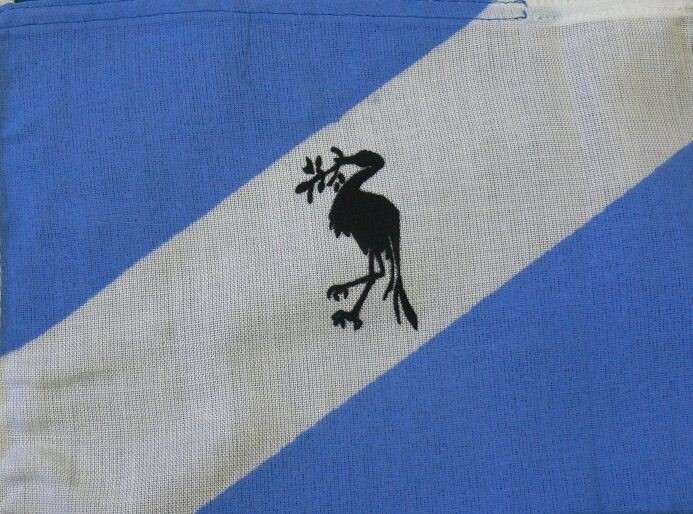 One manufacturer for example, Monograms, produced flags showing a twig in the beak of the Blue Crane although this was never specified for the flag, but was present in the Ciskei's coat of arms. Monograms subsequently won a Ciskei Government contract to supply flags and despite the error being pointed out by Bruce Berry the contract was honoured and the flags printed! I managed to track down Monograms. The company still exists, but they no longer manufacture flags. An ex-employee stated that the company manufactured flags for all the TBVC countries. According to him, Monograms prepared samples for each flag, sent it back for approval to the client and then printed it. He stated that all the flags were therefore pre-approved by the client. To make matters worse Monograms was not the only company producing incorrect flags, which is probably the reason for the variants in our collection. 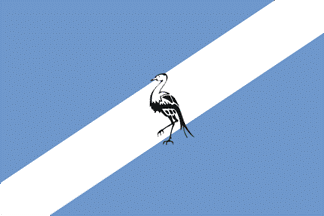 The Blue Crane forms the central element of the Ciskei flag, a bird which is very special to the Xhosa. When a man distinguishes himself on the battlefield or by any deed of valour, he was often decorated by the chief in the form of a presentation of blue crane feathers. The veterans who were honoured in this way would wear the mark of distinction in their hair during a battle. It is, however, still ironic that the indwe was chosen as such an important part of the Ciskei's national symbols as it is also the national bird of South Africa, a country from which the bantustan was supposedly 'independent' of. Allowing these variants to occur in a nation's flag, arguably a country's most recognized national symbol, representing its people, its values and its sovereignty is perhaps tantamount to the Bantustan's true pariah status. The Ciskei was re-incorporated into South Africa on 27 April 1994 and ceased to exist as a separate political entity and the flag, with its variants, is no longer in use. Unidentified ex-employee, Monograms, April 2012. Drawing of the Ciskei flag by Martin Grieve, 07 Dec 2006. Label: These are two variants of the Ciskei flag. Note the clear discrepancies in the depiction and size of the Blue Crane and in the proportions between the blue and white sections of the flags.